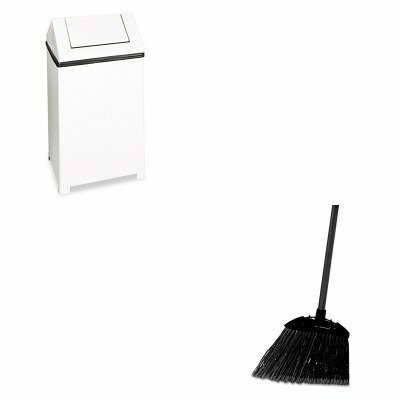 KITRCP637400BLARCPT1424ERBWH - Value Kit - Rubbermaid Fire-Safe Swing Top Receptacle (RCPT1424ERBWH) and Rubbermaid-Black Brute Angled Lobby Broom (RCP637400BLA) by Rubbermaid at Blog Free Here. MPN: RCP637400BLARCPT1424ERBWH. Hurry! Limited time offer. Offer valid only while supplies last. lt;stronggt;RCPT1424ERBWHlt;/stronggt;lt;BR/gt;Rubbermaid Fire-Safe Swing Top Receptaclelt;BR/gt;Get into the swing of keeping your workplace tidier. lt;stronggt;RCPT1424ERBWHlt;/stronggt;lt;BR/gt;Rubbermaid Fire-Safe Swing Top Receptaclelt;BR/gt;Get into the swing of keeping your workplace tidier. Hinged top with self-closing, springless dual entry disposal door. Durable powder-coated or stainless steel construction. Legs feature nylon base pads to protect floor. Contains retainer bands to hold can liners in place. Waste Receptacle Type: Swing Top Materials: Steel Application: General Waste.lt;BR/gt;lt;BR/gt;lt;stronggt;RCP637400BLAlt;/stronggt;lt;BR/gt;Rubbermaid Fire-Safe Swing Top Receptaclelt;BR/gt;Cut and shaped for easy sweeping in hard-to-reach areas. Flagged, acid-resistant polypropylene fill bristles. Will not stain, discolor or absorb odors. Can be used wet or dry. Overall length 35amp;quot;. Application: Spot Bristle Material: Polypropylene.